Ta-da! It should be no surprise that our first 5-Bambi rating goes to Disney’s Fort Wilderness! But we didn’t expect that our late-winter, last-minute fling with The Mouse would leave us feeling rejuvenated – younger, wiser and more hopeful about the future. Disney does a good job with the hope thing and for that alone, we give it our support. … and, it felt new to us. Either Disney has recreated itself, or we entered the parks with different eyes – and ears. After nine days of park and resort-hopping, we pulled out of Fort Wilderness with a plan for our next visit. In other words, we had a lot of fun. Now back to what Fort Wilderness was. But before we launch into the parade of wonderful Disney features, excellent food, and downright spectacular entertainment, it must be said that Fort Wilderness is not your father’s campground – it’s an attraction that just kinda celebrates roughin’ it American-style but, shhh…Don’t tell the children! Everything we look for in a campground is there: hiking and walking, cycling, swimming, and kayaking – all without having to drive away from our campsite. Most loops have a designated basketball court and a children’s playground within walking distance, and volleyball and tennis courts are near the pools. Boating, sea raycers, horseback riding, pony rides, horse-drawn carriage rides are available for an additional fee. For forty-seven years, Fort Wilderness has maintained a reputation for destination camping at it’s finest. This 700-acre wooded retreat with 799 campsites and 409 cabins has an onsite restaurant, tavern, outdoor theatre, grocery store, pools, bathhouses and many sweet features – old and new – that keep a fanbase of friends and fiends perpetually engaged as if it was their second home – some claim they acquired RV’s primarily for Fort Wilderness. And Pico had a good time, too. Pet-friendly features abound in Fort Wilderness. Though trained service pets have few restrictions, pets are generally not allowed in or near pools, playgrounds or restaurant areas. Pico loved his daily trail walks and bike rides, and he also enjoyed staying safe and sound in his own home while we visited the parks. … our quiet and spacious site. Getting around Fort Wilderness is just a rootin’ tootin’ good time! Campground admission includes unlimited transportation by ferry, bus, and monorail to all parks and resorts. We were lucky to have ideal weather conditions so the paved concrete “trails” made our transportation around the park pleasant and effortless. Catching the Disney bus, or ferry was only a five-minute bike ride from our site and security bike racks are provided at all boarding areas. The waits were short. Usually, the ferry was docking or the bus waiting at the curb ready to board as we arrived. There are several ways to get to the theme parks. The bus is quick and easy, but there is also a delightful 15-minute ferry ride across the bay that stops at the front gate of the Magic Kingdom. The kind and cheerful ferry people transported us to various hotel resorts surrounding the bay. Trail’s End Restaurant, The Chuck Wagon, P & J’s Takeout, and the Meadow Snack Bar. Golf cart rentals are also available and some RVers bring their own. … and then to the Polynesian Resort where we enjoyed the Spirit of Aloha Dinner Luau, and then ferried home again, with fireworks lighting up the sky around us. Paddling the creek that loops around the activity area is another pleasant way to spend the afternoon. However, only the rental boats are allowed in the creek. This activity is intended to be a first kayaking or canoeing experience – safe and fun. Experienced paddlers will finish the loop in under 30 minutes. Families will enjoy spotting terapins and other wildlife along the banks. There are two pools located within Ft. Wilderness. The large centrally-located family pool complex has lifeguards and opens at 10 am. This is a busy feature because it includes daily Disney activities for kids. There is a snack bar and we recommend the turkey wrap, big enough to serve two. Next to the large pool is a small-child-friendly water play area. The smaller pool located near the cabin community does not have lifeguards and seemed to be open 24 hours a day. In the early morning, we had it to ourselves. The bathrooms, showers, and laundry room are newly renovated. The bathrooms are spacious, handicapped accessible, secure with key entry and so pleasantly scented I wondered if Minnie Mouse had just stepped in to powder her nose. How they keep the showers and sinks so spotlessly clean and dry was a mystery until early one misty morning I spied a green clothed man leap into his camouflaged electric maintenance vehicle. He saw me too, and with a sparkly smile and a tip of his hat, he turned and zipped away fading into the leafy forest. Wow. I saw one. I really saw one! Depending on the season and type of site – rates range from $55 to $197. So, the priciest campsites would be larger, close to the restaurant, and reserved for holidays such as Halloween, Christmas, New Year or July 4th. Our premium campsite at $153 a night was our only choice on such short notice. But boondocking makes up for this cost and our current average is still only $33 per night – even with four months in Florida. There are no first-come-first-serve sites. All sites must be reserved ahead of time. We got our foot in the door by booking 3 nights just a couple of months ahead, but by checking cancellations daily (if not hourly) on the Fort Wilderness website, we gradually added more nights as folks changed plans and canceled their reservations. We could have stayed longer and next time, maybe, we will! Tent or Pop-Up Campsite: Room for a pop-up camper or a camper van-type vehicle, and up to 2 tents. Only water and electricity, no sewer. No pets are allowed in this area. Preferred Campsite: Room for an RV plus a small tent. Accommodates equipment on a concrete pad up to 10 feet by 45 feet. Full hook-ups. Most sites are surrounded by dense natural forest and undergrowth which gives a sense of seclusion. All sites have a charcoal grill and a large picnic table. Burning wood is discouraged because smoke can be an irritant for many people – especially sick children who are having their Make-A-Wish experience – so only certain fire pits are allowed. Click here for the approved list. Food is important at Disney World and it’s best to plan where to eat. Making reservations for meals on My Disney Experience helped us to schedule our day – knowing we had a reservation for dinner kept us from breaking down and buying snacks and treats which can be more expensive than a quality “all you care to eat and drink” buffet that comes with wine, beer, and a live performance! Bob, our ferry captain, on the way back to Fort Wilderness reminisced about days gone by when his family camped there for $5 a night. Well, the value dynamics have changed, but not the idea. 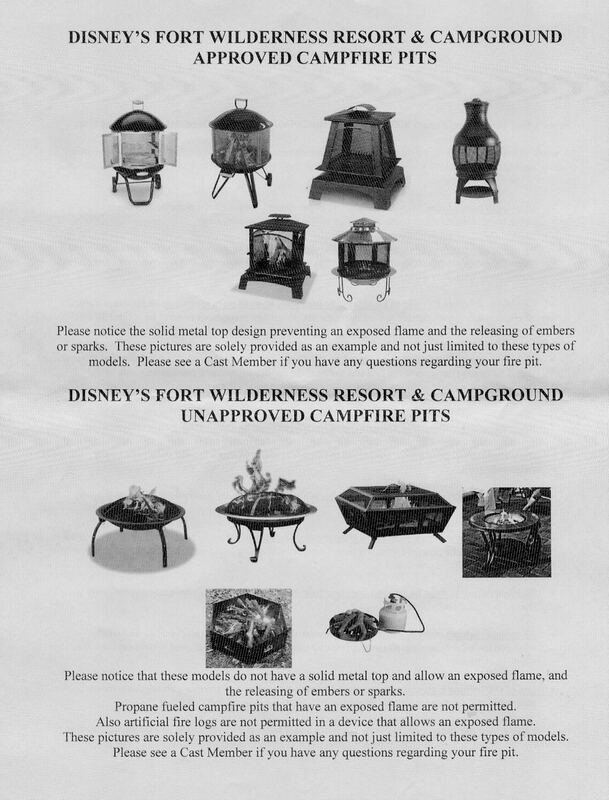 Some folks think Fort Wilderness was a pipe dream or an afterthought of the Imagineers – a low-priority project that was only allowed to progress due to Walt Disney’s carefully drafted plan to widen access to the park. Disney – an admirer of Buckminster Fuller – was an advocate of modular, transitional and sustainable housing and a futurist in his own right. … the way he’d prefer to access his World of dreams and imagination, and maybe this type of development is something that progressive cities should emulate for a world that is increasingly on the move. This is by far the best review I have read of Fort Wilderness. We have yet to camp there. It’s on the list. You answered all my questions. Thank you! I hope you have a fabulous visit to Fort Wilderness! To avoid crowds, keep the academic calendar in mind, such as Spring Break. We would love to go back again the same time of year and stay for the garden show or even in mid-January. What fun! Hi! Congratulations! Enjoy the anticipation. Today is in our 600th day of travel and have stayed in well over 100 campsites and so far, we’ve not had any security issues whatsoever. Of course, we practice awareness in every situation, but we feel as safe or safer than we felt when we lived in one of the safest cities in America. Our security measures are varied and not much different than when we lived in a house. Our biggest fear is hurting ourselves through accidental injury, not someone else hurting us – and leaving our own stuff behind, not someone taking it from us. We’ve heard a few stories like Patricia commented about, below – but we’ve never lost a night of sleep being afraid. But if we were afraid, or annoyed by our neighbors we’d just leave. It’s really that easy – takes us 30 minutes to pack, hitch and leave. So, the hitch lock … we just don’t feel that anyone’s going to go the work of stealing an old 2001 hail-pocked 30′. Thank you for following and enjoy Fort Wilderness! We stayed at the Fort the end of September until the beginning of January, and while I used to love it, it has become a drunk fest on the weekends now. Really loud and obnoxious behavior lately. My husband’s bike got stolen too. Lock was cut while we were sleeping inside the RV. Turned up at a local pawn shop-cops said herion addict. About 25 bikes stolen while we were there. They have a security problem! We didn’t experience any problems like this – or any problems at all. We never locked our bikes and we left valuables outside even when we were away. Our dog is very good on the watch and he never alerted us to anything. Our neighbors were quiet and security seemed to be on the job. Thanks for the response, it’s always a good thing to be reminded that we’re just living outside. Previous Previous post: Magic Carpet Ride to Disney World!